What households in India spent, in crore rupees and all put together, on major food categories in 2011-12. How much do Indian households, all of them put together, spend on fruit and vegetables in a year? How much do they spend on pulses, or footwear, or transport? The Private Final Consumption Expenditure (PFCE) tells us, and these enormous figures are calculated by the Central Statistics Office (CSO), of the Ministry of Statistics and Programme Implementation (MoSPI). The Central Statistics Office has now released the ‘First Revised estimates of National Income, Consumption Expenditure, Saving and Capital Formation’ for the financial year 2011-12. Here, in the biggest of big numbers for an ocean of motley small purchases, is what we now know: that Private Final Consumption Expenditure (or PFCE, to add to the army of acronyms) at current prices is estimated at INR 5,056,219 crore in 2011-12 as against INR`4,349,889 crore in 2010-11. In constant (2004-05) prices, the PFCE is estimated at INR 3,334,900 crore in 2011-12 as against INR 3,088,880 crore in 2010-11. It is the food category of the PFCE that I am interested in and, at current prices, consumption expenditure by India’s households on food has risen from NR 990,511 crore (about USD 182 billion) in 2008-09 to INR 1,472,086 crore (about USD 271 billion) in 2011-12 (in current prices, the corresponding figures in constant 2004-05 prices are INR 929,881 crore and INR 1,046,228 crore). There is an earlier year given, 2004-05, which is the year to which the constant price has been based, and it becomes useful to use this to estimate the rise (in a straight line for convenience) for the intervening years to provide a sense of what components of the food main category are rising more quickly than others. 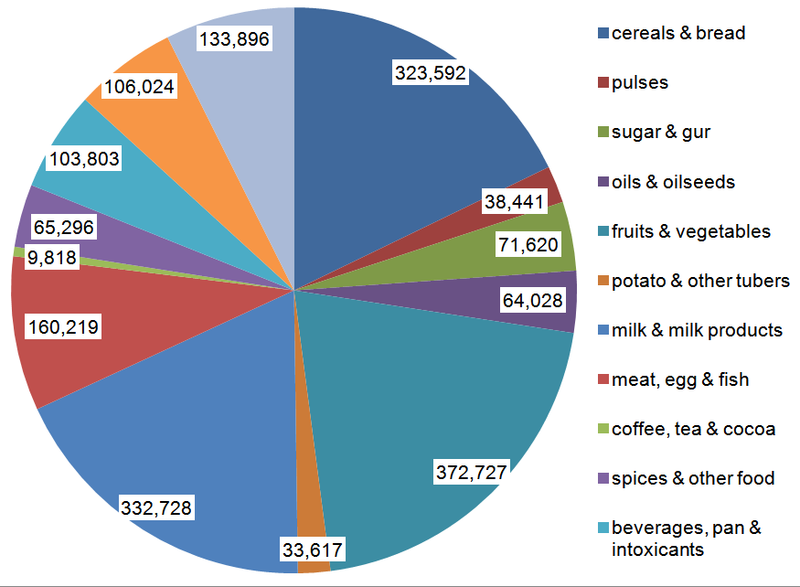 Under food, the component with the highest PFCE is ‘fruits and vegetables’ with INR 372,727 crore – see the pie chart. This is followed by ‘milk and milk products’ with INR 332,728 crore and by ‘cereals and bread’ with INR 323,592 crore. Using the set of current prices, and examining the increases in PFCE for two periods – 2008-09 to 2011-12, and 2004-05 to 2011-12 – we can see which food components have attracted the greatest expenditure. These increases (as they are calculated using current prices) are likely to be as much a tale of inflation in the price of that food component as they are to be due to the changing dietary patterns in urban and rural India. Hence we see the expenditure on ‘potato and other tubers’ having risen 78% in 2011-12 from 2008-09, and this is the steepest food component rise (this is a puzzle). Close behind is the 76% increase in ‘hotel and restaurants’ which undoubtedly reflects the growing new tendency (especially amongst youth who have migrated to cities to take up service sector jobs) to eat their meals out. Expenditure on ‘tobacco and its products’ from 2008-09 to 2011-12 has risen 61% while on ‘milk and milk products’ it has risen 59% over the same period, and this gives a number to the explosion of dairy products in the last five years.